Micron has announced that it has commenced mass production of the industry's highest capacity monolithic 12 Gb LPDDR4x DRAM for mobile devices. 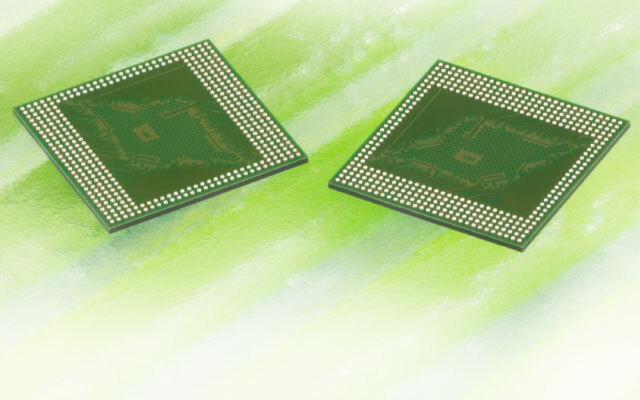 The latest LPDDR4x chips aim to offer double the memory capacity while consuming lesser power and still retaining the same footprint as the previous generation. Micron has started mass producing its LPDDR4x DRAM chips fabricated using the 1Y-nm (10 nm) process. Micron says that its new chips are the industry's first high-capacity monolithic 12 Gb mobile DRAM modules and they are capable of up to 10% lesser power consumption than the previous generation for similar data rates at up to 4,266 Mbps. Micron is not alone in the LPDDR4x market, though. SK Hynix introduced 16 Gb LPDDR4x chips back at the start of 2017. Micron's 12 Gb capacity is lower, but it allows the company to offer lower-cost quad-die solutions than the competition. LPDDR4x has an output voltage of just 0.6 V compared to 1.1 V in LPDDR4, which translates to increased power efficiency for mobile devices. Micron says that these higher DRAM capacities are required to support the increasing use of AI and AR in mobile devices. With the imminent arrival of 5G handsets next year, having denser memory with higher data rates will help in faster real-time processing of data. The memory semiconductor market is controlled mainly by Samsung, SK Hynix, and Micron. In fact, Samsung had already announced plans for bringing LPDDR5 DRAM to market by H2 2018 but that date has now been pushed to 2020 with both Samsung and Micron expected to kick off LPDDR5 production sometime next year. Till then, LPDDR4x should provide the needed data rates and power efficiencies for the upcoming crop of mobile devices. BOISE, Idaho, Nov. 07, 2018 (GLOBE NEWSWIRE) -- Micron Technology, Inc., (Nasdaq: MU) today announced that it has begun mass production of the industry's highest-capacity and first monolithic 12Gb low-power double data rate 4x (LPDDR4x) DRAM for mobile devices and applications. This latest generation of Micron's LPDDR4 memory brings key improvements in power consumption while maintaining the industry's fastest LPDDR4 clock speeds, thereby delivering advanced performance for next-generation mobile handsets and tablets. In addition, Micron's 12Gb LPDDR4x doubles memory capacity to offer the industry's highest-capacity monolithic LPDDR4 without increasing the footprint compared to the previous generation product. The exponential increase in usage of compute and data-intensive mobile applications such as artificial intelligence (AI), augmented reality (AR) and 4K video has been accompanied with demands by mobile users to maximize battery life and performance and increase capacity. Next-generation mobile devices that integrate multiple high-resolution cameras and increasingly use AI for image optimization also require higher DRAM capacities to support these features. As the industry transitions towards deployment of 5G mobile technology, the memory subsystem in mobile handsets will have to support these dramatically higher data rates and the associated processing of data in real-time. New applications built upon 5G technology will also be able to leverage the increased capabilities of the memory subsystem to enable new and immersive user experiences. As the industry's highest-capacity monolithic mobile memory, Micron's LPDDR4x DRAM delivers industry-leading bandwidth and power efficiency, along with the benefit of enabling higher DRAM capacities in the handset. "Micron is a recognized pioneer in bringing low-power DRAM technology to the world and we once again have delivered another milestone with the launch of the industry's first, highest-capacity monolithic 12Gb mobile DRAM," Senior Vice President and General Manager of Micron's Mobile Business Unit Raj Talluri said. "This latest generation of LPDDR4 enables mobile handset manufacturers to deliver a rich user experience for ultra-slim mobile devices as user demands for performance, capacity and longer battery life continue to rise as a result of data-intensive applications." The LPDDR4x DRAM will be produced based on 1Y-nm (10-nanometer-class) process technology, resulting in improved efficiency and reduction in battery power consumption. Micron's LPDDR4x mobile DRAM is capable of reducing power by up to 10 percent at similar data rates of 4,266 megabits per second (Mb/s) compared to previous generations. Micron 12Gb LPDDR4 memory solutions are available today. For more information, visit www.micron.com. Micron Technology is a world leader in innovative memory solutions. Through our global brands — Micron®, Crucial® and Ballistix® — our broad portfolio of high-performance memory technologies, including DRAM, NAND, NOR Flash and 3D XPoint™ memory, is transforming how the world uses information. Backed by 40 years of technology leadership, our memory and storage solutions enable disruptive trends, including artificial intelligence, machine learning, and autonomous vehicles, in key market segments like cloud, data center, networking and mobile. Our common stock is traded on the Nasdaq under the MU symbol. To learn more about Micron Technology, Inc., visit micron.com. ©2018 Micron Technology, Inc. All rights reserved. Information, products, and/or specifications are subject to change without notice. All information is provided on an "AS IS" basis without warranties of any kind. Drawings may not be to scale. Any dates are estimates only. Micron, the Micron logo and all other Micron trademarks are the property of Micron Technology, Inc. All other trademarks are the property of their respective owners.